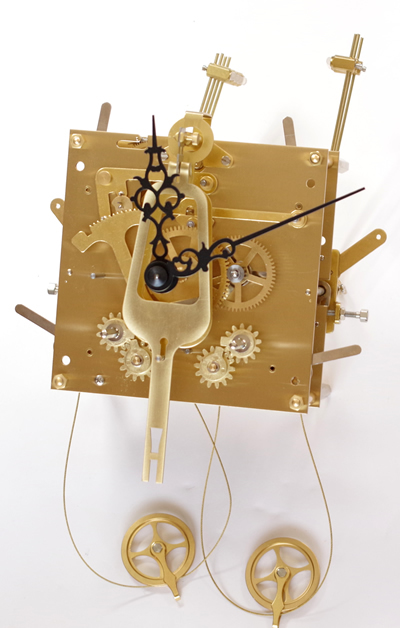 Grandfather Clock 2080mm tall, 610mm wide and 305mm deep. (Kieninger movement installation drawing included). 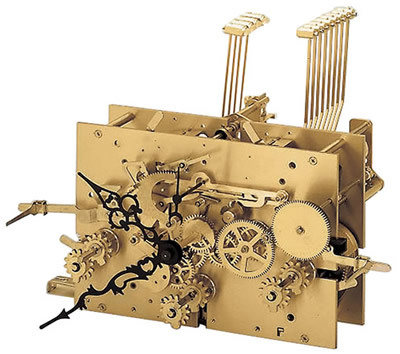 Constructing this clock case will require a reasonable degree of practical skills but not beyond any one who is prepared to study the drawings and instructions. Please take adequate time in planning the stages of cutting blanks of timber and fabricating the templates that will be used in conjunction with a router to shape the moulding etc. The end result will provide great satisfaction and enhance your home. Frank will provide ongoing advice especially when you ready to install the movement etc. A comprehensive set three very large plans with drawings of full size templates; and diagrams showing cutting and machining guidance. Sixteen A4 pages of assembly drawings and ten pages of printed instruction. Pendulum length 100cm. Cable & Weight drive. Plays the Westminster, Whittington & St. Michael melodies on a 12- rod gong. 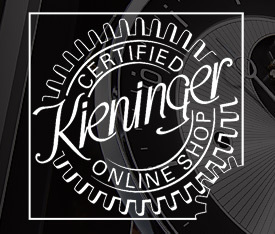 Dial: Kieninger 250 x 350mm Moon dial (including Serpentine hands) with Brass Arabic numerals on a silver chapter ring. Cast spandrels. Shell Fillings: Chime 3kg (Iron); Time 3kg (4kg for heavy pendulums) Iron; Chime 4kg (Iron). The KSU 36 Movement specifications. Plate size 141mm x 200mm x 2.5mm. 6 bronze bushes, manual selection of the Westminster, Whittington & St Michaels melodies, Dead beat Graham escapement, Maintaining power, Automatic Tick (beat) adjustment, Maltese cross, cable winding stops to prevent over-winding, Separate controls for Chimes and he Melodies - The control that protrudes through the left slot in the dial allows selection of - Silent, Automatic Night silencing between 10pm to 7-15am or Continuous chiming. The control that protrudes through the slot on the right side of the dial controls the three melodies and allows selection of Silent and the three melodies. The Hourly chimes and the melodies are played on a 12-rod gong. 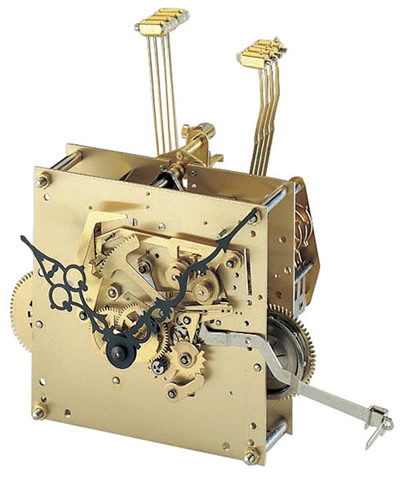 This movement set requires a minimum measurement of 215mm from the front of the hands shaft (inside face of the dial glass) to the inside of the rear panel and to achieve eight-day running, the weights need to be able to drop a minimum distance of 1260mm, measured between the centre of the dial and the inside bottom of the cabinet. The distance from the rear panel to the front face of the weight is approximately 185mm. As a guide a pendulum with a 140mm bob will swing 240mm, a 165mm bob swings 250mm, a 200mm bob swings 280mm and a 225mm bob swings 280mm. The Lyre Pendulum 094, 100cm with a 225mm bob measures approximately 920mm from the hand-shaft to the centre of the bob. 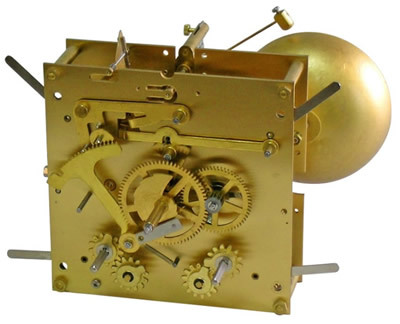 Click here to view the Set 44 Movement Dials and Pendulums images page. Click here to view the Set 44 Options and Prices page. Weight Shells: Polished brass weight shell complete, 50 x 245mm. Shell Fillings: Strike 3.0kg, Time 3.0kg, Chime 3.0kg. 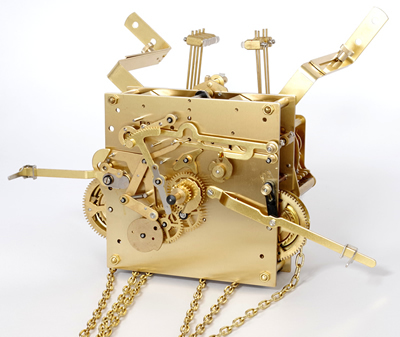 The RK 047 movement specifications. Plate size 131mm x 131mm x 2.0mm with 6 bronze bushes. The movement plays the Westminster melody on the quarters on four rods of the gong. The movement strikes the hours on four rods of the gong. 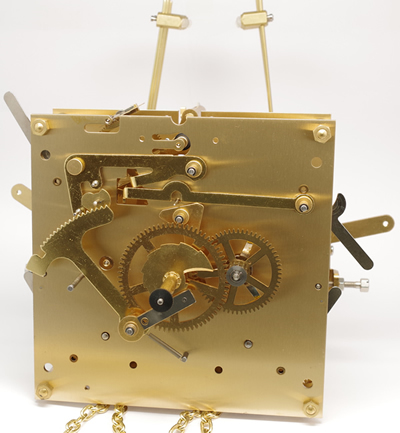 Two levers allow selection of Continuose, Automatic Night Silencing or Silent for the Strike and Chime. Handshaft protrusion (movement front plate to tip, 35.8mm. The movement requires a minimum measurement of 165mm from the inside face of the dial glass to the inside of the rear panel. For 8-day running the weights need to be able to drop a minimum distance of 1325 mm, measured between the centre of the dial and the inside bottom of the cabinet. When using the timber pendulum with a 140mm bob, the distance from the hand-shaft to the centre of the bob is 760mm. The swing is about 240mm. The distance from the rear panel to the front face of the weight is approximately 140mm. 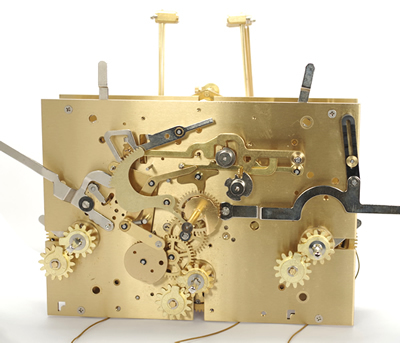 Click here to view the Set 50 Movement Dials and Pendulums images page. Click here to view the Set 50 Options and Prices page.